On June 1, 2001, I had what you might call the good luck to be in Kathmandu when most of Nepal's royal family was massacred. The next morning I was listening to the BBC on my shortwave radio. 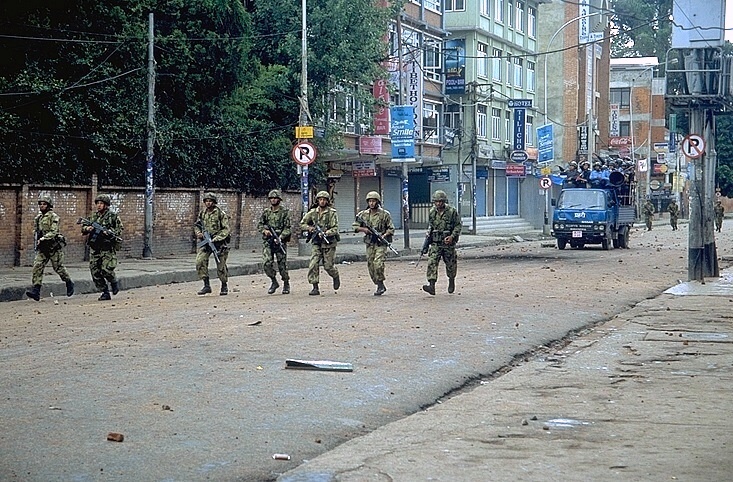 When they announced the massacre, I jumped up to look out the window and down to the street. People were strolling around as though nothing had happened - and I thought, I'm the only one who knows! As it turned out, everyone knew, but they were in shock. It was a fascinating time to be here, and I was chronicling my experience via the five e-mails posted below, as well as taking slide film photos, which weren't processed until months later. This is the first time I've put them together. It's a long story, but hopefully worth it. There are small photos along with the text, and they are all shown full-size after the e-mails. Enjoy! Remember when I forgot to e-mail you that I was headed to Mt. Kailash in Tibet? Well, you can forget that you never read it, because I'm not going. Two days before we were to leave, we found out that the Chinese government had suddenly and inexplicably stopped giving tourist permits to Kailash. I'd bought a tent and stove and a bunch of food for the walk around the holy mountain, and I ended up selling most of it to someone who was going later. It was opened up a few days later, but too late for me to be able to go on the trip. 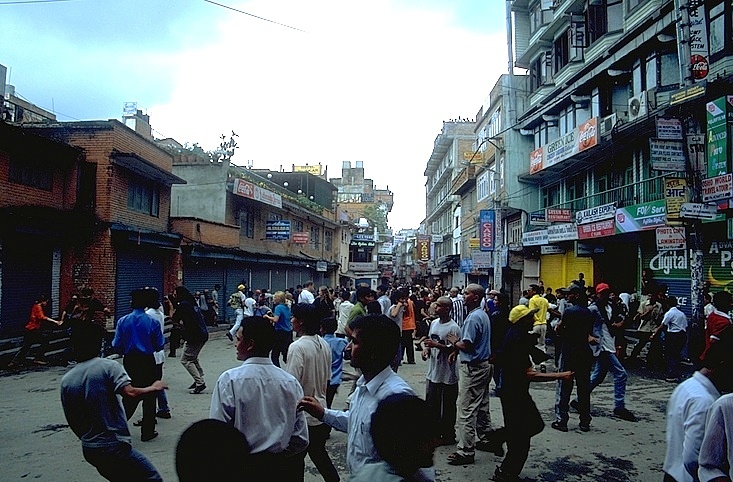 But today's drama in Kathmandu overshadows any postponed trip to Tibet. 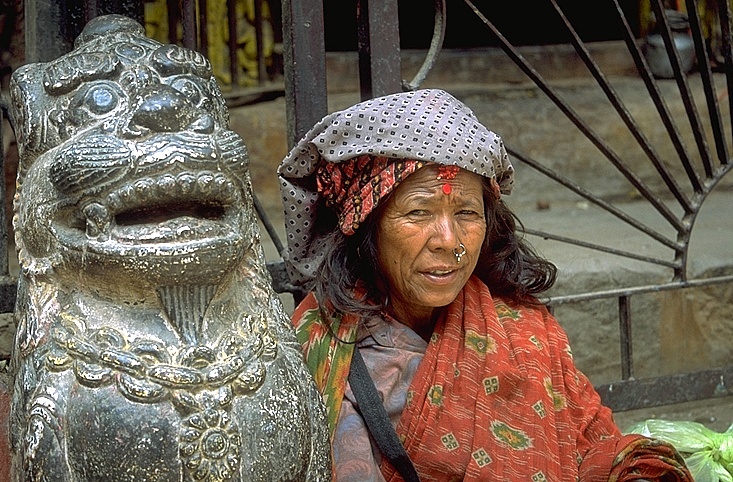 Nepal has a much-beloved king and queen who live in a palace that's only a half-mile from Thamel, the tourist heart of Kathmandu. The king is revered as an incarnation of the God Vishnu, and the king and queen's photo is in almost every business in Nepal. Last night almost the entire royal family, 11 people or so, we murdered in one horrific incident that's being blamed on the king's son and heir to the throne. Apparently he opened fire on his family with a machine gun after being unhappy with his mother's reaction to his suggested fiancé, and then turned the gun on himself. 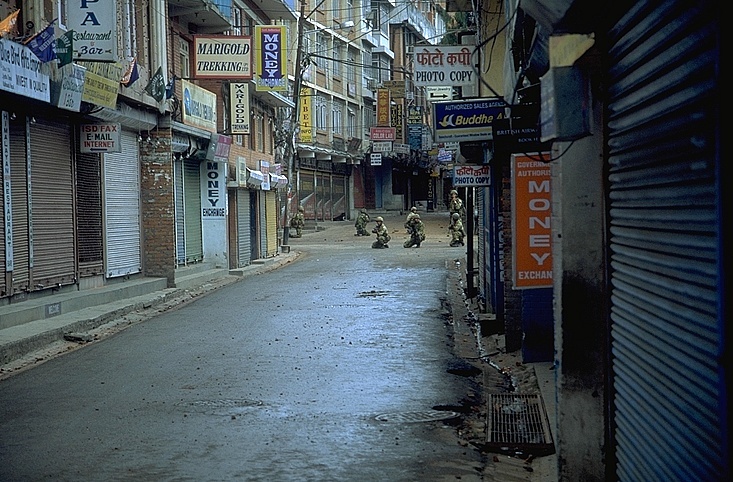 The whole country was in shock this morning, and normally bustling Thamel was a ghost town of shuttered shops and dazed tourists wondering where they were going to find their next banana pancake. I was in one in tiny breakfast place, one of the very few that was open, when suddenly a throng of people starting running crazily past, and into, the shop. It was startling and scary as some people hurriedly pulled down the shutters to protect those of us inside and lock out whatever the danger was outside. It turned out that not a single person knew why they were running except that everyone else was running and encouraging others to do the same. It showed the level of tension in the streets that so many people were so jittery. Most of the town was locked tight today, and the few restaurants that were open were filled to capacity with tourists. No one really knew what happened, or could predict what tomorrow will be like. Incredibly, the prince who apparently committed the crime survived and is brain-dead and on life-support, but was officially proclaimed as the next king. His uncle, the former king's brother, is widely rumored, at least on the streets, as having been behind the mass murder. He was expected to be made the next king, but he's been named the regent, since the new king is incapacitated. It has really been a surreal day. 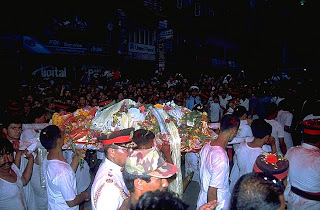 In the afternoon a parade-like procession came through Thamel carrying the bodies of the slain king and queen, as well as three other slain members of the royal family. It was an amazing scene to see the number of people who came out for the last glimpse of their king and queen. 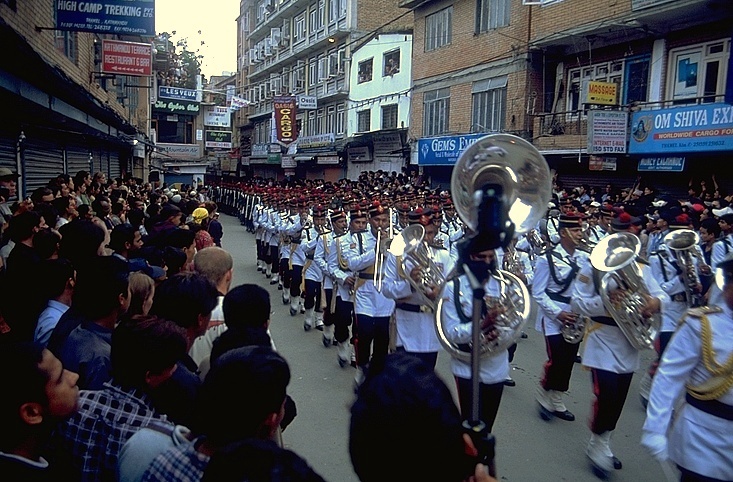 We waited in the street for three hours until they came filing past, accompanied by military bands and soldiers. The bodies were carried on bamboo litters, wrapped in sheets but with the faces showing. 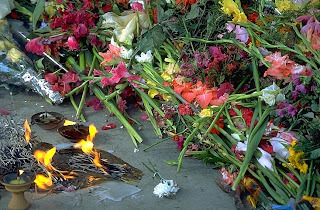 People threw flowers or ceremonial scarves on the bodies as they went past. I didn't have much of a personal feeling for the king or queen, but when a woman behind me starting sobbing loudly and holding her hand over mouth, I found it really touching and sad. It's so easy to turn a human tragedy like this into just a good travel story and forget about the thousands who are profoundly affected by it. The current rumor is that there will be a thirteen-day mourning period, five days of which there may not be anything open. Today there were no buses running and it was rumored that many flights were cancelled. People are unsure of whether there will be food available tomorrow, or whether they'll be able to leave the country as planned. I'll be here for another week or two, so I'll keep you updated. I find it just amazing what you can get used to. The first time I got tear-gassed today, it was unsettling and a little uncomfortable. 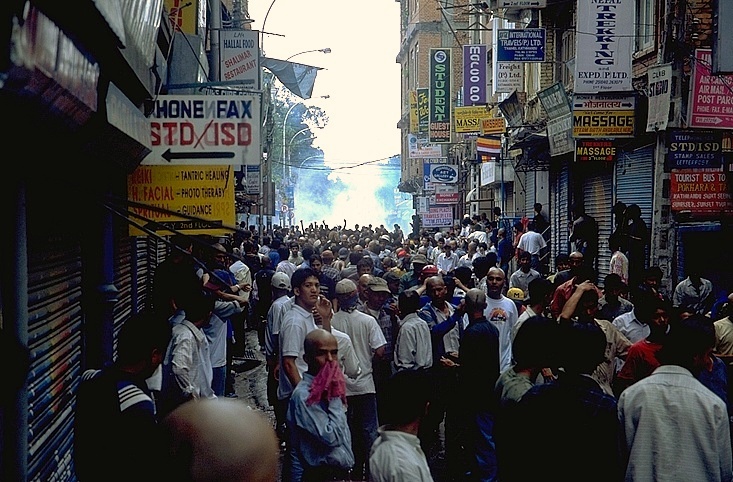 But later in the day the affects seemed more exciting than scary and there was less of a tendency to bolt when the billowing clouds of gas filled the narrow streets in Thamel. How did it come to this?? It seems completely unreal to be relaying this story, and the surreal-ness that I referred to in my last e-mail seems tame compared to today's events. The mass murder of almost the entire royal family was initially blamed on the king's eldest son, who was later in the day named the new king. Then the official version of the tragedy was that it was an accident! The killer prince, now king, died today and the original king's brother was made king. This new king, the third in four days, named Gayanendra, is terribly unpopular, at least in part because his son has run over and killed three pedestrians in the last four years. Shakespearian! 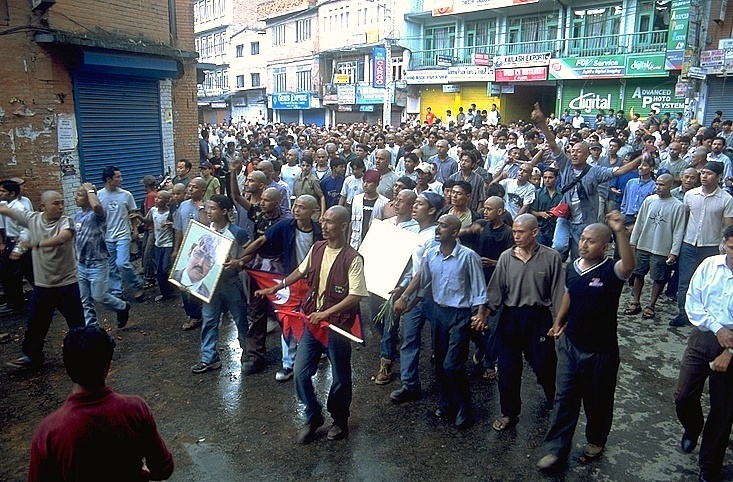 Protesters filled the streets of Kathmandu today, including the tourist enclave of Thamel. They're mostly angry young men looking for a legitimate explanation for the murder of their beloved king. They don't have a particular target for their anger, so they end up taking it out on the police when the police try to block their path. An intense encounter of about 100 motorcycles lining up face-to-face with riot police this morning ended without incident. But it got ugly this afternoon as protesters starting throwing bricks and rocks at police, and police responded by shooting tear gas canisters at the crowd. That crowd included a lively group of dim-witted tourists who were sure that they weren't a target and hoped that the tear gas would go around them (it didn't). It was a combination of a fearsome intensity and a good-spirited sporting match. When the tear gas was fired, everyone ran like crazy to get away, laughing and yelling and taunting the police. Leaders of the protesters would yell and gesticulate at the police, and the police would do the same in return. At one point I was right near the front of the protesters. Okay, actually I was in front of the front of the protesters. 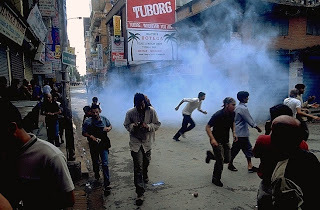 When the police fired the tear gas, it went well behind me, and to retreat I'd have to run through the gas cloud and follow the protesters into a narrow alley. So I stood there and waited while the police charged forward and caught up to where I was standing. They totally and completely ignored me, and didn't mind as I switched sides and starting taking pictures of them and the protesters from a different angle. 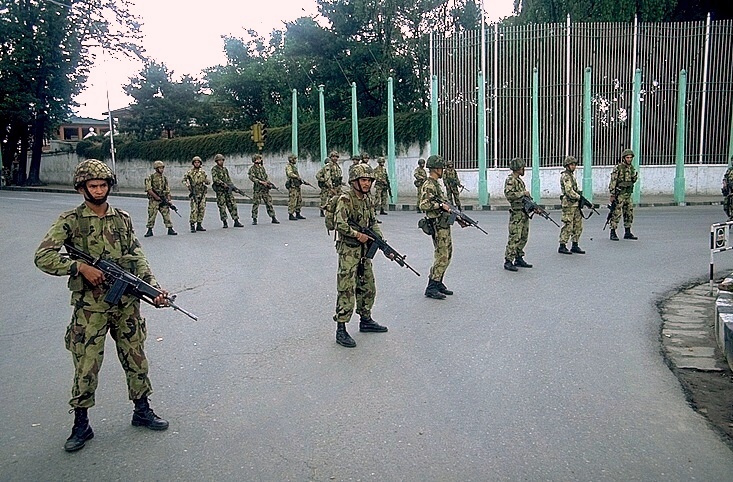 The frivolity went on for probably two or three hours, until the police were replaced by the army. 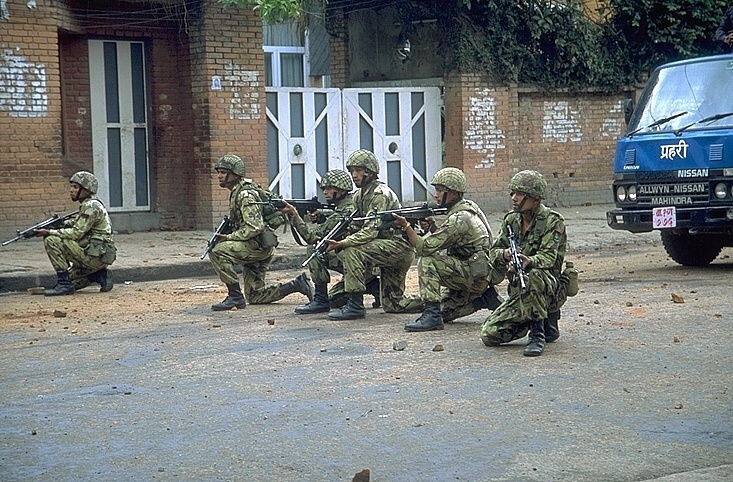 They were wearing green camouflage and carrying what appeared to be machine guns. All of a sudden, people stopped throwing rocks. 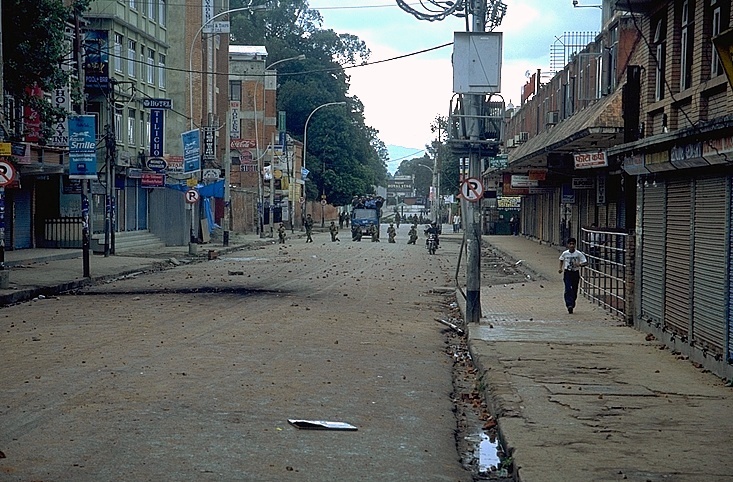 An hour later a curfew was called, and the announcement was made that people seen in the streets could be shot. As difficult as it might be to believe at a distance, there were still quite a few people out in the streets, and not all of them locals. It got freaky when the army guys laid down on their stomachs with their legs spread and pointed their guns in our direction. It was enough to make some people head to their hotels. I'm writing this from the Kathmandu Guest House, which has maybe the only available internet shop in Thamel. It's anyone's guess how the next few days or weeks will turn out here, but my guess is that the protests will become stronger, and will end up with shots being fired at protesters. There are rumours about protesters being killed today, but nothing is confirmed, and hard information is difficult to come by. There is no easy solution to quell the violence, since almost the entire royal family was killed; there is no alternative to the current unpopular king. And since it was almost certainly a conspiracy of some kind (rumours are that closer to 40 people were killed, including bodyguards and servants), the truth can't be told as a way to soothe the populace. I'll write again soon. 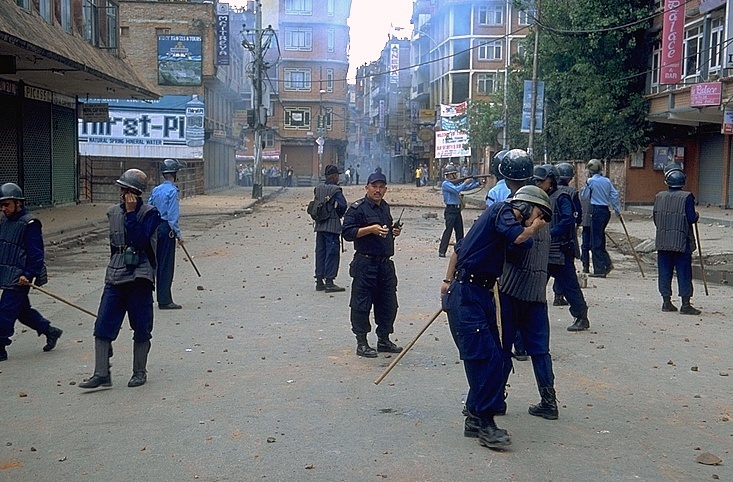 Calm has returned to Kathmandu after the first curfew was ordered following Monday's riots. We had a brief break Tuesday morning before a noon-to-midnight curfew was ordered for Tuesday. It's Wednesday night now, and yet another curfew was ordered at 9 tonight. Information only comes out in bits and pieces, but the riots on Monday weren't as fun for everyone as they were for me. Apparently three people were killed and two dozen were shot by police. The paper said 480 people were arrested. 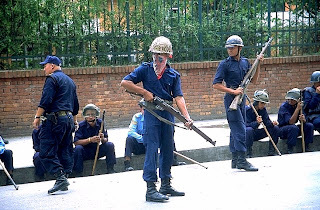 During yesterday's curfew I was outside the Kathmandu Guest House watching a bit of an argument between the blue-clad police and the camo-clad army. The army was in an open-topped jeep with several soldiers, one of whom was aiming his machine gun over the hood. After the arguing continued for a minute or two, the soldiers got out of the jeep, taking defensive positions around the vehicle, and the lead soldier turned his gun from the front of the car to point it sideways towards the police. I have no idea what they were arguing about, but it stopped soon thereafter. That curfew was much more strictly enforced than the first one, although tourists were allowed to move between the few places that were open. 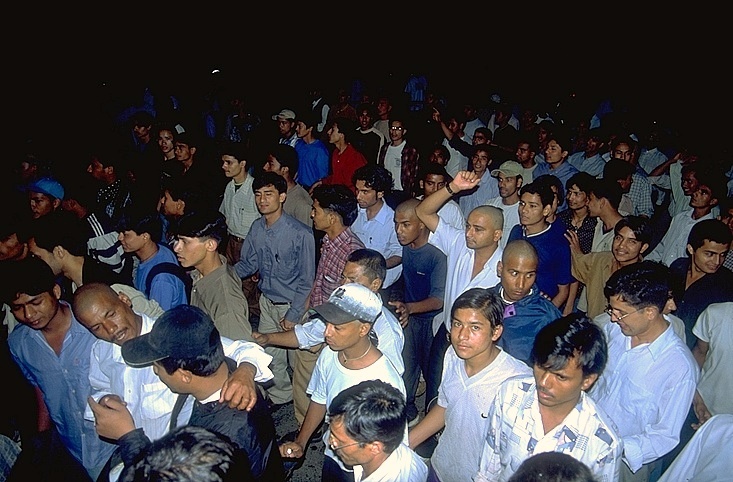 I had to walk back home late at night during the curfew from the Kathmandu Guest House. It's only about a five minute walk, but it's a eerie feeling to walk down the streets and only hear the sound of your own footsteps. 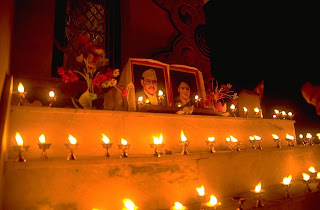 As I last wrote, there was a hastily arranged cremation of the brain-dead-prince-turned-king and coronation of the new, and quite unpopular, King Gyanendra. He's in an unenviable position, especially if he's not the murderous scoundrel that everyone thinks he is. He's ground zero for the conspiracy theorists, and has a son who's a lunatic, by most accounts; that son will someday be made king. An indication of how Gyanendra is thought of was shown in a surprising quote in today's newspaper. One of the leaders of an opposition party said that if it's found that the successor (meaning Gyanendra) or his family was responsible for the massacre, he should be tried for murder. That raises the speculation from the street gossip it had been prior to that. The new king appointed a three-person panel to investigate how the massacre occurred, which went nowhere when one of the people refused to participate. It was the promise of a report that seemed to cool people down. If the investigation doesn't get underway soon, the pressure will build again. But by many accounts, regardless of what the panel finds, that's when the protests will begin anew. It seems likely that there will be more intense protests regardless of what happens. Another tidbit that hasn't made the newspapers was told me by a trekker who'd just finished the Annapurna Circuit. One of the most popular spots on the Circuit is Tatopani, where the hot springs have made for a thriving tourist stop. 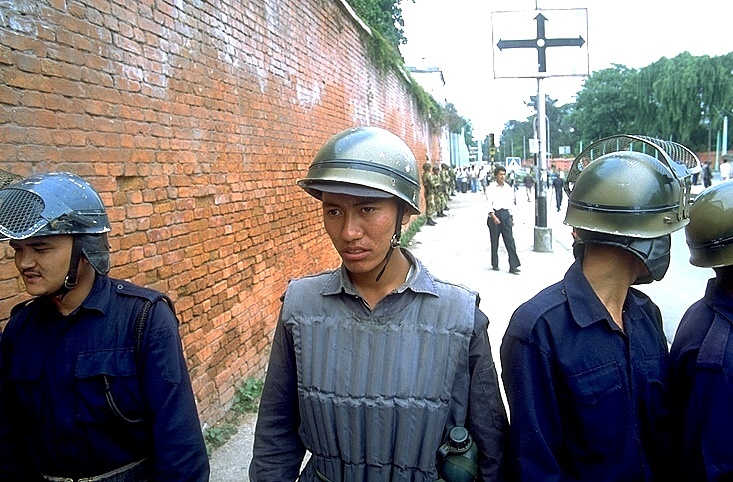 The Maoists, a Shining Path-style guerrilla group that have been fighting to overthrow the government in Nepal, let the police know that they were coming to Tatopani. They told them they could fight if they wanted, but they were coming either way. The police all fled, and when this trekker was there just one week ago, there were some 75 Maoists wearing military fatigues wandering around town, polite and well-spoken, and no police. That seems to me to be a landmark in the battle between the Maoists and the government, and threatens the tourist trade to a large degree. That's probably why it hasn't been reported yet. The latest semi-official explanation for the massacre is shifting back to the prince as being responsible. For the public to buy this, there will need to be full reporting and a transparency that the government and royal family aren't used to. It was so widely reported on the street that the prince had wounds both in his back and his stomach, after he was supposed to have shot himself once in the head, that most people don't seem to question it. He could have been a nutter, but what happened to the huge security contingent that would surround the royal family? Where were they then, where are they now, and where are all the servants that would have been at the family dinner? If it could have been simply explained by saying it was the prince, they've lost their chance, because that story's lost its "legs" at the moment. It will take some work to get the people to accept it. I'll keep you posted if something big comes up. 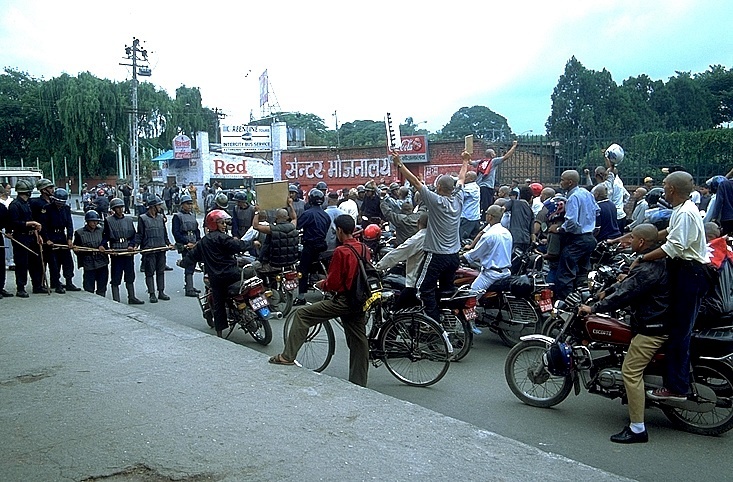 The newspapers came out today with the first eyewitness account of last Friday's massacre of the royal family, claiming that it was, indeed, committed by the Crown Prince Dipendra. When I asked the guy who makes my daily mango and yogurt milkshake (orgasmic!) if he believed the story, he gave me that are-you-retarded look, and shook his head no. He said "no one in Nepal will believe that." That expresses the sentiment of most people it seems, though my skepticism about it may be for different reasons than theirs. Most people here can't imagine a son killing his parents, especially a prince, while I'm from the U.S. and find it unlikely but not impossible. I have questions about where security was for the reported 15 minutes of the killing spree and how, if the prince was as drunk as reported, could he wreak that kind of havoc. I asked two men standing in the front of a shop on the street whether they bought the prince-killer story. They paused a bit, then said it might not be a safe thing for any of us to be talking about. Their English wasn't good enough for them to clearly say why, but it was good enough for them to leave no doubt that they were completely dismissive of the notion of the prince as the killer. Rumors abound. There are stories about doctors at the military hospital where the royals were treated that haven't been heard from since the shooting, and more funeral pyres than are normal. I heard second-hand today of a Westerner who owns a restaurant and has lived here for years, who "knows for a fact" that five cooks from a prestigious restaurant have not returned to work after their gig at the Royal Palace last Friday. The speculation is of a massive cover-up, and today's report didn't make much of a dent. Parts of the story seemed reasonable to me until I read the bit about the new king's son, Paras The Lunatic, who "saved many lives that day" when he kept a group of teenagers from being shot. He stood in front of the teenagers and pleaded with the prince to spare them. This is the Paras who runs people over with his car, then drives away? Homey don't buy that story. The government-sponsored cover-up, er, investigation began today. It's led by only two people after the third declined to play; one is a judge and the other a politician. The probe will take three days and will include ballistic and forensic tests and interviews with all the witnesses and doctors who treated the survivors. In three days. Right. 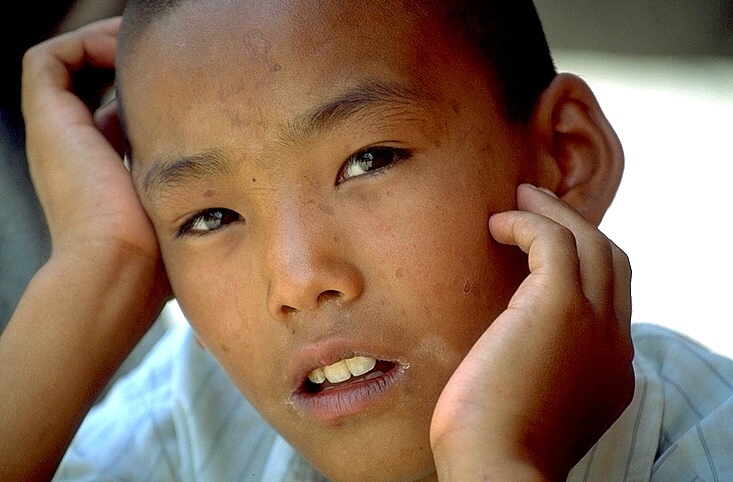 I heard about a 12 year-old kid whose eyes were inflamed after the tear gas during the riots. When my friend showed concern, he said, "It's nothing. I would gladly take a bullet for my king. He is my king and he is my father and I love him." Meanwhile, grown men still get emotional and misty-eyed about their loss. A man yesterday, describing his pain, said that his heart was very small, and gestured that it was like the size of a pea. These are such sad times for the people here. They feel completely unprotected after seeing that even the king isn't safe, and they don't feel they have a lot to look forward to. They have no expectation of receiving the truth from the Royal Palace or the government, and they are powerless in the face of it. 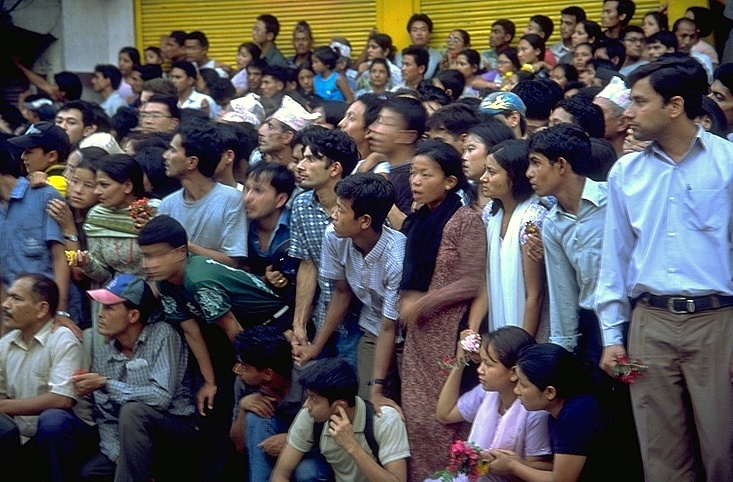 I realized today that although there aren't that many tourists around, there are just as many Nepalese. They have nowhere else to go. 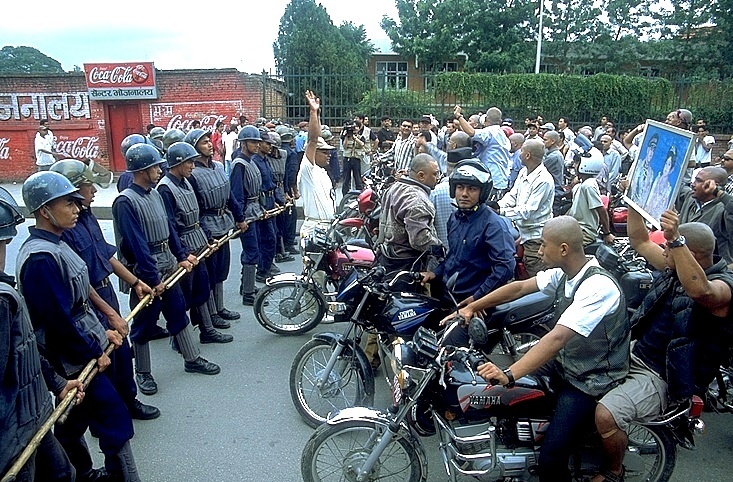 The much-anticipated report about the massacre of the Royal Family of Nepal was released last Thursday. 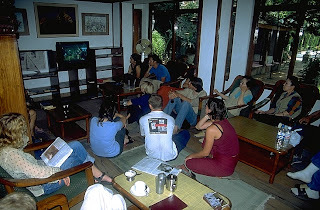 I saw the report being read live on TV, first in Nepali and then in English, and was struck by how few of the restaurant staff were watching it. It was fully expected that Prince Dipendra would be blamed for the shooting, and most people were so dismissive of the investigation that they weren’t interested in hearing the report. 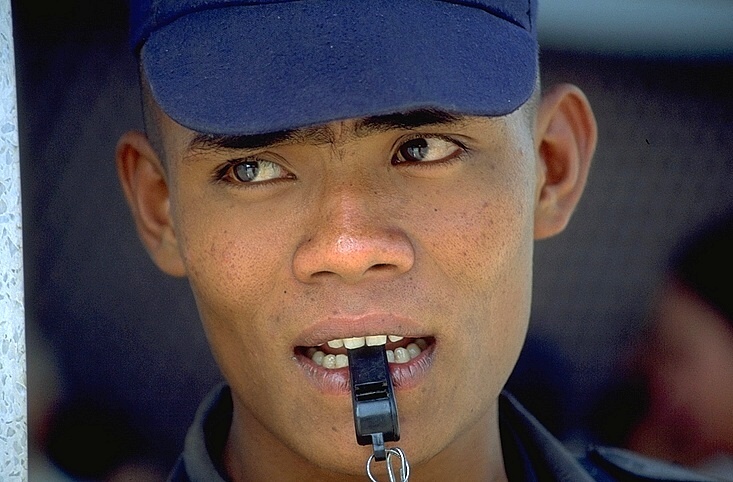 There were lots of scowls and snorts from the staff, and when a pair of Dipendra’s boots were held up, a waiter said, "They're fake! It's all fake!" I thought, what if they are - they're just a pair of boots. My question was why show them at all? The six-page synopsis report was posted on the internet and printed in newspapers, and reads like a teenager's book report. Apart from language problems, it was filled with unimportant details and had glaring omissions, like, for instance, motive. It said, for example, that "physical items and materials were subjected to scientific tests" without saying what those tests, or their results, were. Here's an editorialized summary of that night: Prince Dipendra was stumbling drunk on whiskey, and had been smoking cigarettes laced with hashish and an "unidentified black substance." 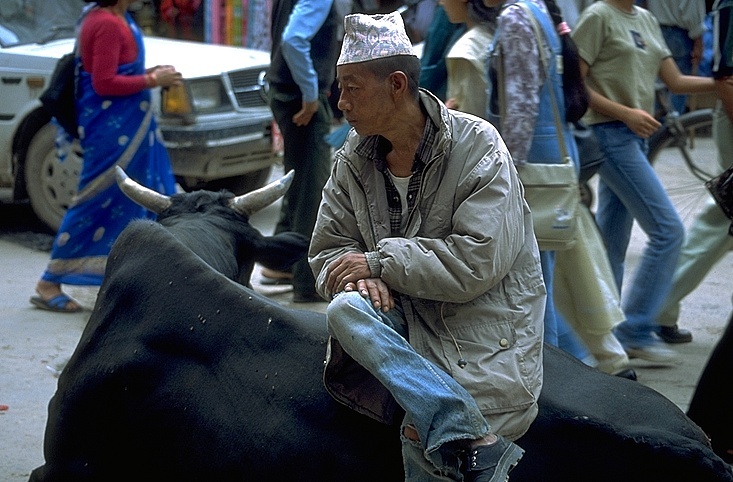 (Experts on the street - ok, tourists - speculate that it may have been opium.) He was seen "swaying, unable to hold himself upright" and four people had to accompany him to his room. There he made several phone calls to his girlfriend, Debyani, (the marriage to whom his parents opposed.) She said that his voice was so slurred that she worried about him and called attendants to look after him. The attendants found him in his room, lying on the ground, apparently unable to get his pants off. After they helped him, he went into the bathroom and vomited, then called his girlfriend again and said, "I am now about to sleep, good night, we'll talk tomorrow." Half an hour later, this stoned, drunken, swaying, I-can't-get-my-pants-off Prince emerges from his room as Rambo. Dressed in military fatigues, he killed his father first, then went on to murder a total of nine people, including his mother, brother and sister. As a final testament to his dexterity and marksmanship, he apparently shot himself in the left temple, even though he's right-handed. He must be tough, too, because they found two empty bullet casings next to his body. Most people can only manage to shoot themselves in the head once. No one would confuse my version with balanced reporting, but there seem to be enough problems with the story as reported that it's hard to accept at face value. It's not that it couldn't have happened as reported, but the story is odd. There were three rifles, two pistols, and several ammunition clips found at the scene, which seems like a lot to carry for one drunken person to carry, much less aim accurately. Why wasn't the Prime Minister told of the shooting for something like an hour after it happened? Why did every person get taken to the military hospital, even though there are other hospitals nearby and they were taken in individual cars? 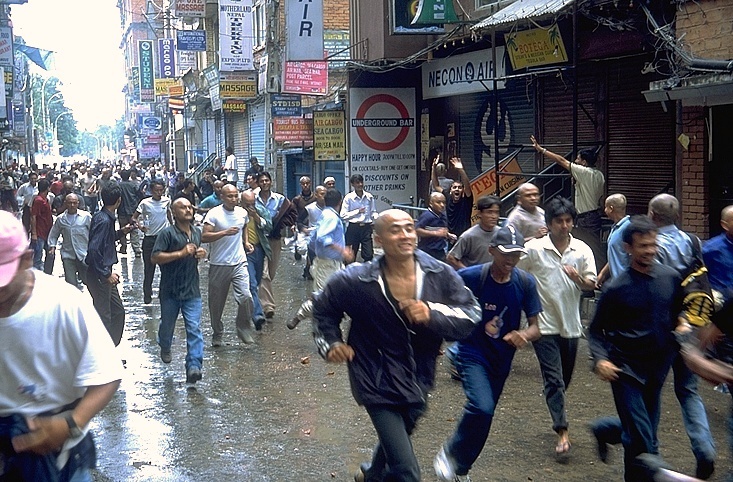 Why would the Queen "give chase" to Dipendra well after he'd begun his killing spree? Where were the security personnel for the length of the shooting? (The whole incident was only one and a half minutes, not the fifteen minutes I said in the last letter.) Where are the autopsies of the bodies, or why weren't they performed? 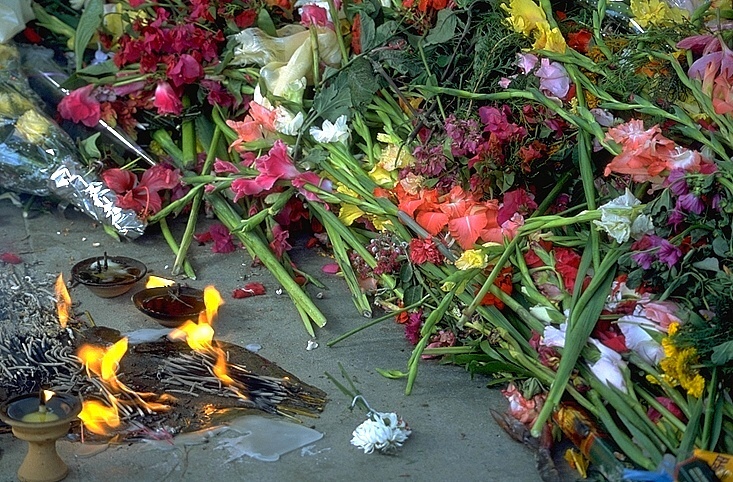 Why weren't independent examiners allowed to see the bodies prior to their hasty cremations? I met an American woman who has been here for 10 years, and knows some of the Royal family. She thinks all this talk of conspiracy is just a bunch of hooey. 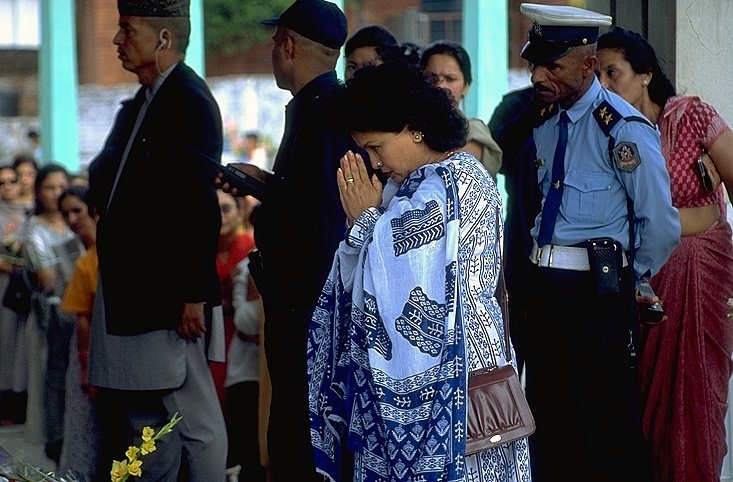 She was told first-hand or second-hand on the night of the massacre that it was Dipendra, and she doesn't doubt it a bit. There's one conspiracy theory that's floating around that's too outlandish to believe, but makes a good story, nonetheless. It was an impostor! Someone with the girth and features of Dipendra may have done most of the killing. 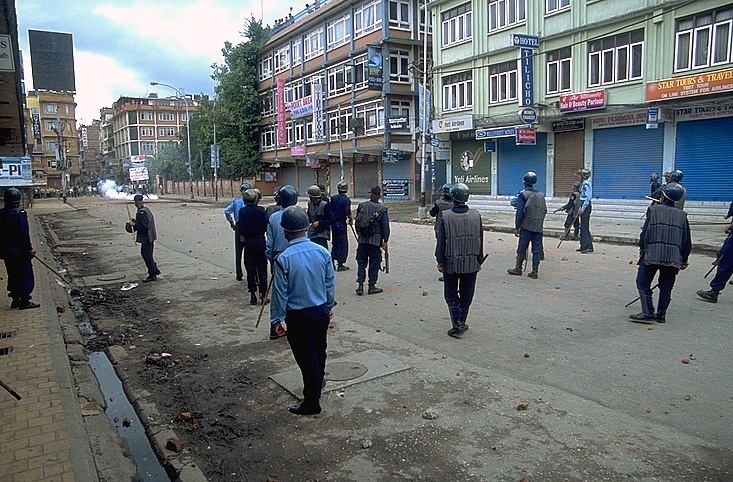 An eyewitness reported that Dipendra was wearing a hat pulled so far down that you "could barely see his eyes." Outlandish, yes, but it could answer every question raised. It raises one more, however: would an impostor really fool eyewitnesses? 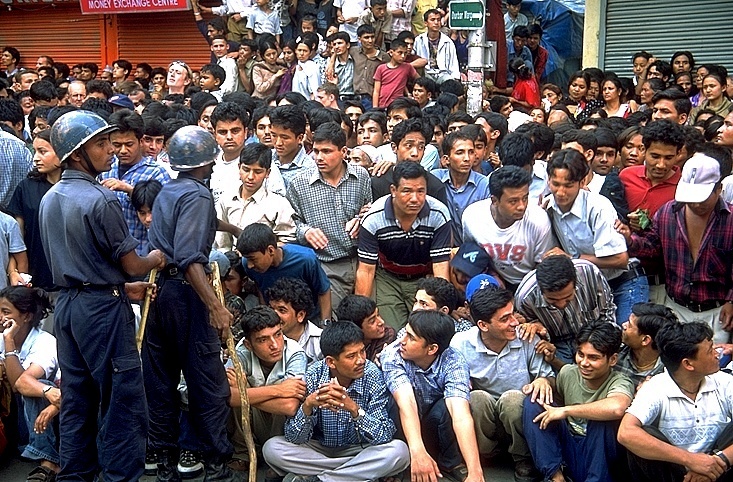 I've yet to find a Nepalese who believes that Dipendra was solely responsible. I asked a shopkeeper if he accepted the report, and he said, "We must." His response was laced with resignation and defeat rather than trust in the report. Most people, including me, expected protests and violence following the release of the report, but it didn't happen. There were a few reasons why. It was reported in the paper that about 1,000 people have been arrested, either for talking about the massacre, or because they're known agitators. Groups were randomly arrested just for talking together. People are also skeptical that they'll ever know the truth, so they aren't very fired up about protesting. And lastly, people knew that if they protested, it wouldn't be long before the army opened fire into the crowd. I suspect, though, that the frustration they feel over the loss of their king and a suspected cover-up will be added to all the others, and make the next protest that much more charged. This chapter is coming to a close for me, as I'm flying tomorrow, June 20,  to Frankfurt, Germany. I'm sorry to be leaving this beautiful and chaotic country, as usual, but I have no doubt I'll be back again. The lobby of Kathmandu Guest House, where tourists and locals were glued to the screen, trying to figure out what was happening. 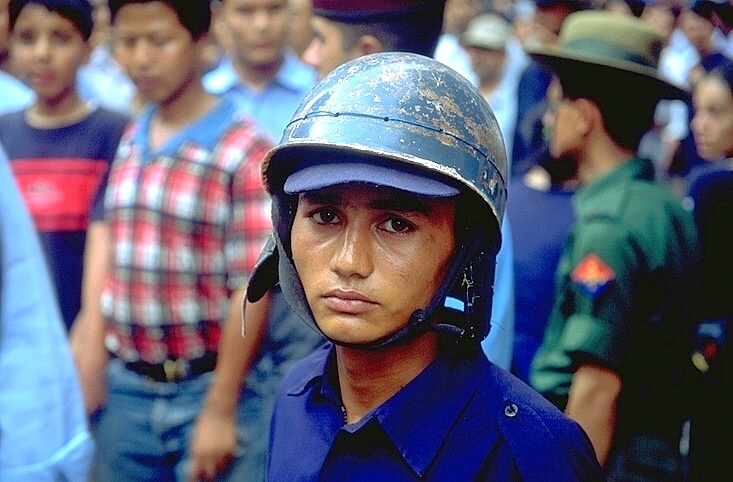 A policeman, maintaining order as the surging crowds waited for the procession of family members who were killed. We waited three hours here. I believe this is the King's body, with his face uncovered. 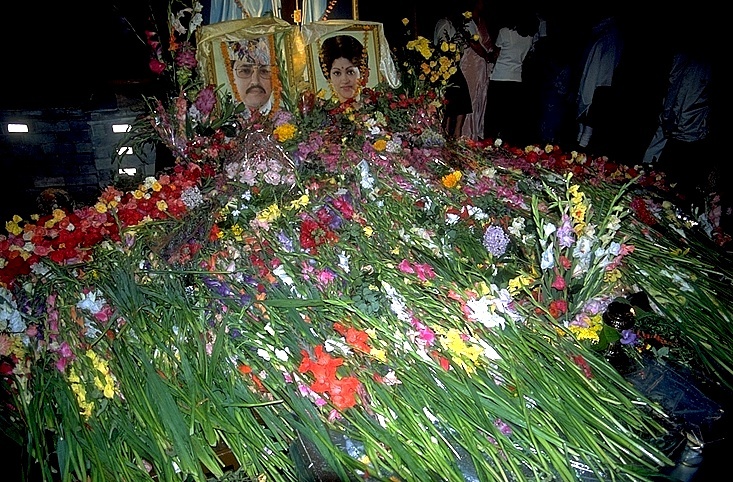 A spontaneous memorial for the King and Queen. 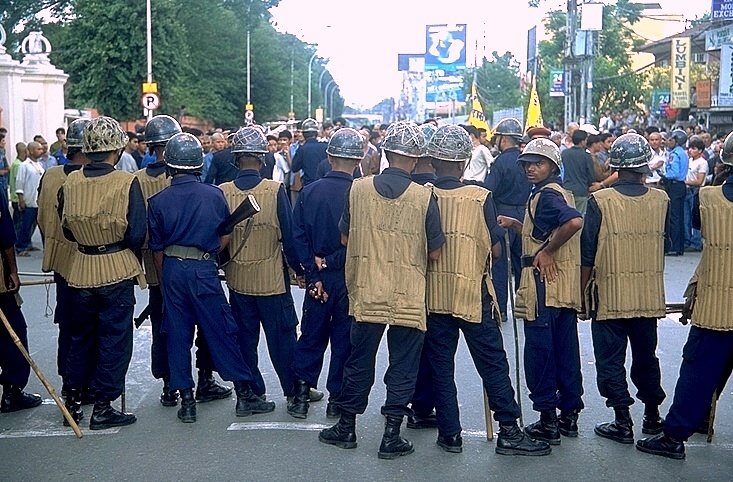 A large group of young men on motorcycles were parading and protesting through the streets, but were blocked by the police from getting to the Royal Palace. It's not clear where this is headed, but you can see in people's body language that it's tense. Uh-oh. Tear gas. That stuff is nasty. You can just make out the police in the distance. The streets are wet from people upstairs supporting the protesters by dropping water down so people could rinse the tear gas off. 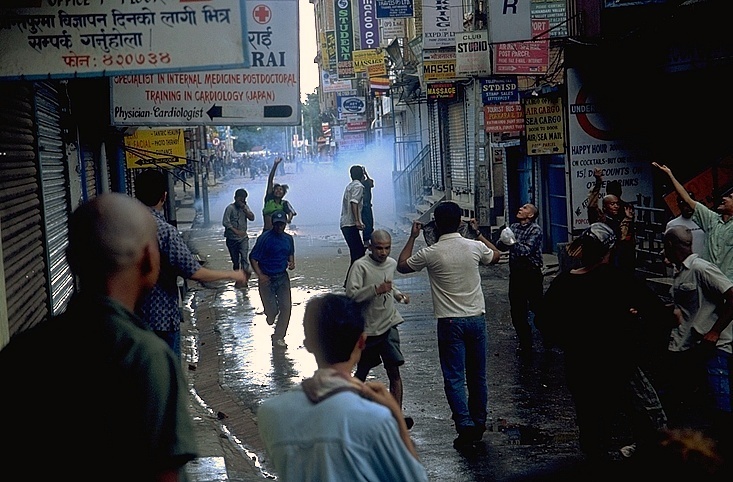 Throw rocks, inch closer, wait for the tear gas to be shot. Retreat. Repeat. 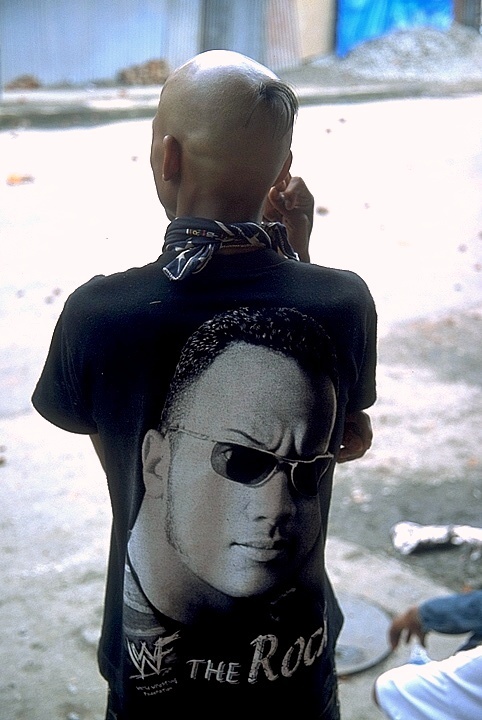 Notice how many shaved heads in the crowd. 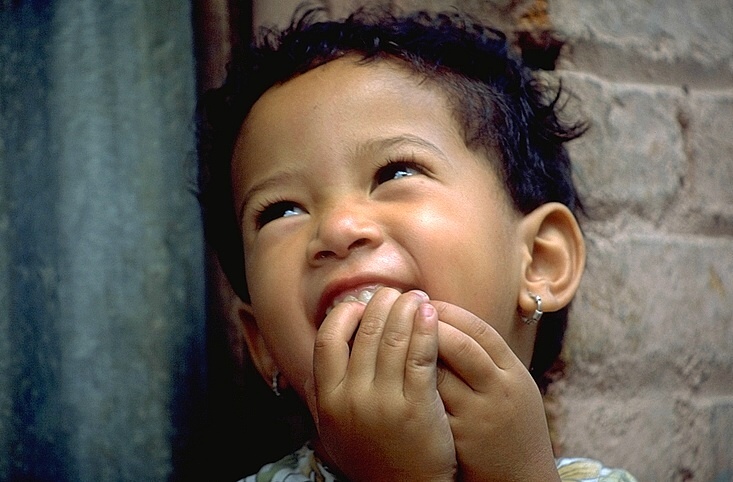 This photo, and others, were used by the BBC for their "On This Day" series. I saw their request for photos two years later and sent some in. You can see them here and read more about the event, as well. This is after I've switched sides. Rocks are littering the ground after being thrown by protesters. The police would sometimes throw them back. The local commander, apparently, looking my direction. He never said a word to me. 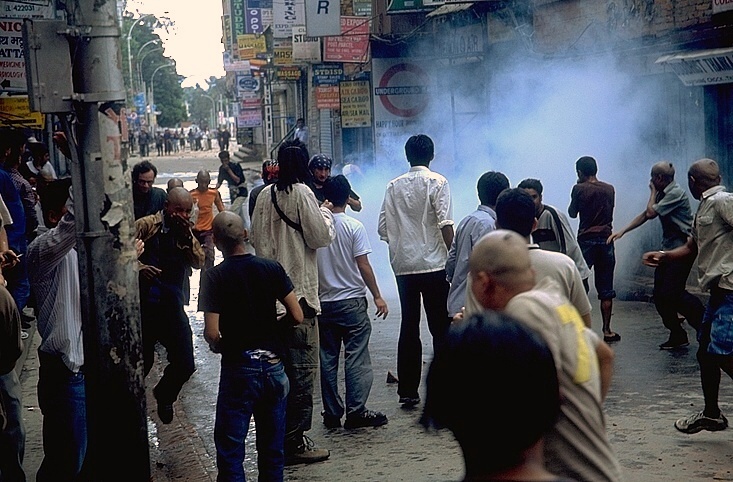 The blue smoke is tear gas. The military arrives, and the protest stops soon after. The army starts to march forward, periodically stopping in formation and raising their rifles. It was designed to impress and intimidate. It worked. I'm not sure why I thought it was OK to be standing here and taking these photos. Not too many spectators left on the street by now. I had a pair of binoculars and as I raised them to my eyes I saw one of the soldiers pointing his rifle straight at me. That freaked me out - it looked like he was standing right in front of me. 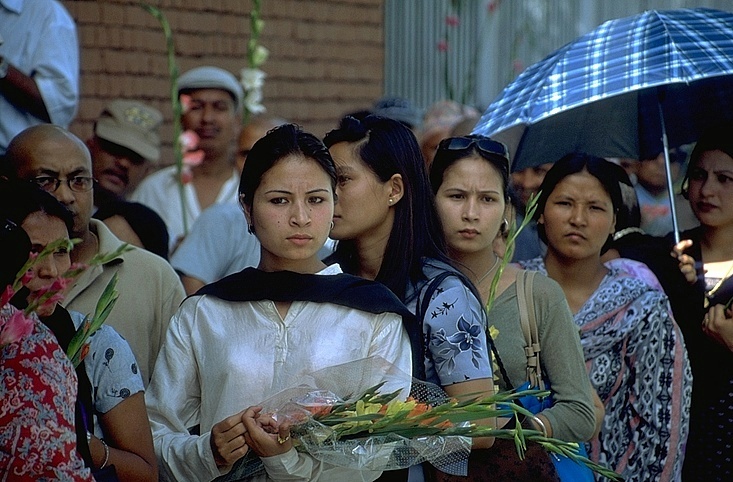 There was a long queue of people waiting to go into the Royal Palace to pay their last respects. Memorials like this were all around the city. And life goes on, somehow. The kids were still playing in the streets. People were as beautiful and colorful as ever. "You show your worth by what you seek."